Tylee's Human-Grade Dog Food gives you all the benefits of a homemade meal for your pup, without any of the prep time. Tylee's is made with human-grade ingredients just like you would find at the grocery store—real, whole foods you can see and identify. Real meat is cooked and combined with nutritious fruits and vegetables then frozen to keep in all the flavor and nutrients. Chewy is offering the Tylee's Human-Grade Dog Food 50-oz. Bag in several flavors (Beef, Chicken, Turkey or Pork) for $24.99. Use the coupon code HUMANGRADE to make it free! 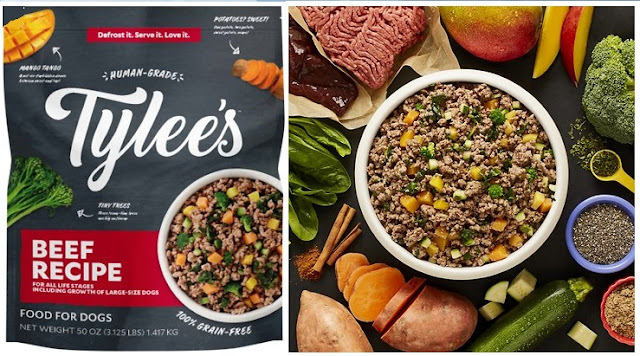 THE FINE PRINT: Tylee's promotion is limited to 1 use per customer and is valid only on your first bag of Tylee's human-grade frozen dog food. To redeem, cart must contain one eligible 50-oz bag of Tylee's human-grade frozen dog food and must enter the code HUMANGRADE at checkout. 100% discount will be applied to the first eligible 50-oz bag of Tylee's human-grade frozen dog food. Limit 1 free item per customer. Offer subject to change. Limited time only, while supplies last. Click for more pet freebies!